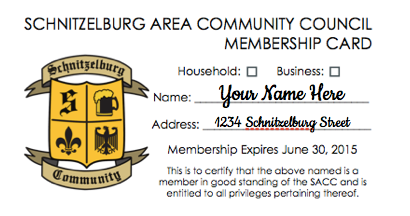 Schnitzelburg Area Community Council: Are You a SACC Member??? Are You a SACC Member??? At my first SACC meeting a few years ago, I was asked to become a member for $10. With a shrug of my shoulders, I decided, "Why not?" Ten dollars was an amount I was going to spend on lunch or a couple of drinks at a bar, so why not give that same amount to an organization that could use the money to build a better community in which I had just bought a house? Fast forward to 2014. As the current Chair of the Membership Committee, I'm now the one asking people to become SACC members. In the past two years, SACC has made a lot of improvements to membership in an effort to boost lackluster numbers. Each new member is sent a welcome letter, magnetic SACC event calendar, and SACC sticker. You can now pay your membership in the comfort of your own home via PayPal. Memberships can be purchased at any SACC event and we can even take your credit card payment with our Square app. Membership cards have a fresh new look and entitle the holder to monthly Membership Deals with local businesses. Soon, business members will have new window decals to proudly identify theur support of SACC. We've made it simple and worthwhile to be a member, but why are our membership numbers so low? Let's crunch some numbers. There are varying numbers for Schnitzelburg's current population, though most numbers are in the 4,000 range. We'll use City Data's number of 4,635. For the 2013/2014 membership year (membership runs a fiscal year from June to July), we had a combined household and business membership count of 110. 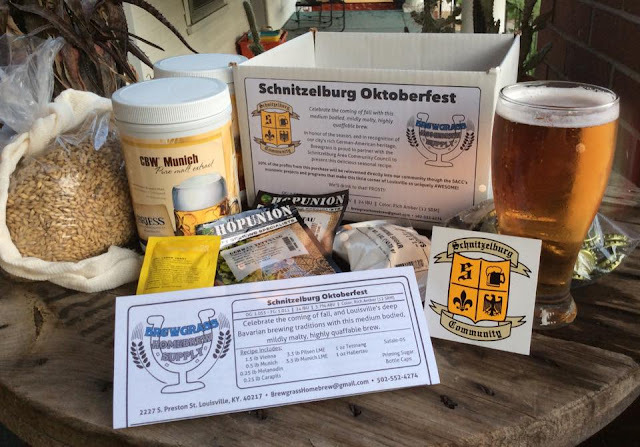 That's only 2.3% of Schnitzelburg's total population supporting the SACC. Household membership is only $10 a year. That's it. Break it down and that's only 83 cents a month. Less than a dollar every month to support the community. The Schnitzelburg Area Community Council is not religiously affiliated. We don't support a particular political party. We don't have any paid board members. We don't have a hidden agenda. Our goal is easy: Make Schnitzelburg a stronger, healthier, happier neighborhood to live, work, and play. The majority of SACC is funded in two ways: 1) Money raised through membership 2) NDF money. This money is very important to the SACC, the surrounding neighborhoods, and the City of Louisville. I am not aware of a more active neighborhood association and our volunteer work coupled with the NDF money is paying big dividends. Not only do our efforts vastly improve Schnitzelburg but they also have many positive spillover effects in our adjoining neighborhoods, especially Germantown. HOWEVER, after some Councilpersons abused these funds, new rules were set in place for applying and receiving NDF's. While these rules are needed, especially for accountability purposes, it has become harder for honest organizations to get funding from the already dwindling NDF funds (Jack Trawick, the former Director for the Center for Neighborhood's wrote a letter to Metro Council on the importance of these funds). Due to the red tape and vanishing NDF money, the SACC is now even more dependent on raising money through our own efforts. Hosting events, such as a movie night, an Easter egg hunt, potlucks, the #1 Citizen's Dinner, the Dainty Contest, etc. Covering overhead, such as office supplies, stamps, stickers, event calendars, etc. 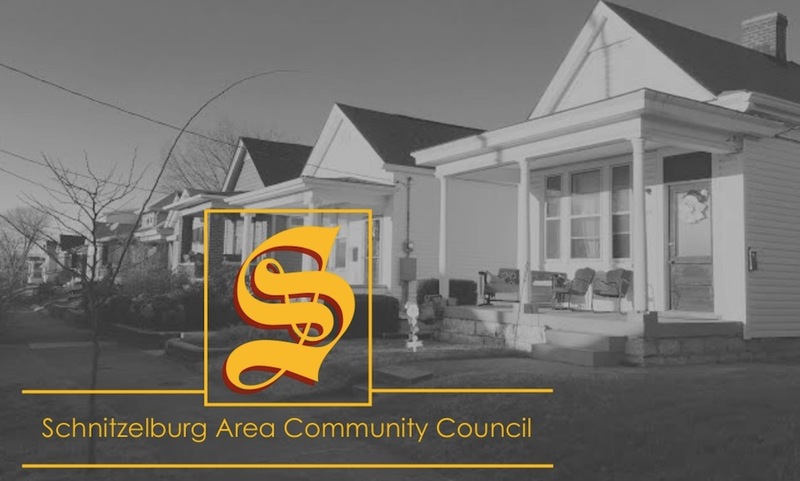 The SACC is made up of volunteers with diverse backgrounds and talents who are dedicated to enriching our neighborhood and connecting with neighbors. We hope you now understand better who we are, what we do, and how important your membership is to the SACC. If you aren't currently a member, please consider joining! Membership can be mailed (SACC PO Box 17603 Louisville, KY 40217), paid via PayPal (in the right sidebar), or you can join at any of our meetings or events. All we need is your address, phone number, email, and money! Check out the "Membership" tab at the top of the page for more information. And you don't have to live in the neighborhood to support it!